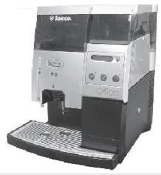 Saeco Royal Offcie (SUP015V) operating manual. This model is sold in some countries as model Ambra Office Vending machine. A coin operated mechanism can be connected. This one time downloadable PDF document is a final sale with no return or refund. Please select purchase carefully before downloading. Manual includes operation machine and programming dose. Avoid 70% of malfunctions and save a lot of repairs cost. Do not use Vinegar for descaling. Do not use Reverse Osmosis or distilled water. Have you descaled your espresso machine lately? It extends the life of machine. Helps to heat water better and improves the jet of steam pressure. Descaling is the single most important maintenance for all espresso machines. Cleancaf, Cafiza, Joe Glow, Brew Rite, Pulycaff, Joe Glow are products sold as descalers but they contain only Baking soda which is totally ineffective. Use Axor select Best descaler #DSC-6, available on this Internet store.